The purpose of EMS is to provide immediate medical care in the hopes of prolonging life, as well as providing individuals the means to promptly get definitive care when they need it. But as in so many other professions, events don’t always go as planned. One such case of alleged EMS negligence was made in Palm Beach County, according to The Palm Beach Post. Claimant in this case had been in a serious car accident, wherein she suffered neck and shoulder pain due to another driver rear-ending her with his vehicle. However, that was reportedly just the beginning and her injuries worsened, she says, when the Palm Beach County Fire Rescue squad came to her aid and attempted to take her to a nearby hospital. Paramedics on scene reportedly placed her onto a gurney and strapped her in. However, as they were trying to load her into the ambulance while on that gurney, they dropped it. As explained by her injury lawyer, the road wherein the crash occurred was a bumpy one. The patient, as could be expected of one who was seriously injured, had little control and began to slide a bit to the side. This suddenly altered the weight distribution of the stretcher and, as paramedics reportedly did not have control of it, the stretcher flipped and she was dropped, reportedly smacking her head on the concrete road. She was disoriented and confused as paramedics picked her up, loaded her into the ambulance and transported her to a nearby hospital. This was in 2012. The 69-year-old resident from Lantana was reportedly later diagnosed with a mild traumatic brain injury. Previously a nurse, the effects of the traumatic brain injury left her unable to return to work. The Post reports plaintiff needed to undergo surgery on her neck and shoulder as a result of the car accident, and her medical bills from that alone exceeded $200,000. The mild traumatic brain injury, however, she says it what cost her more because she was not able to return to work. The county chose to settle the case for $100,000. This is likely far less than her total damages, given that long-time nurses can make well over $80,000 a year in salary. It’s not clear why plaintiff chose to settle for so much less than what her damages likely were, but it probably has something to do with the fact that damages for Florida government employee negligence are capped at $200,000 anyway. Although many cases against EMS, EMTs and paramedics may fall under the umbrella of medical negligence/ medical malpractice, a case like this could be framed as one of general negligence. It’s an important distinction because medical malpractice lawsuits are much more complex and the evidence burden is higher than in a general negligence case. 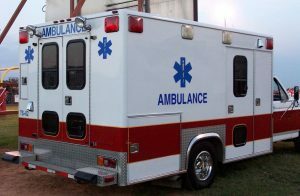 If you are injured as a result of care you received from EMS workers, contact our Palm Beach medical malpractice attorneys to learn more about how we may be able to help. Contact the Palm Beach EMS injury attorneys at Halberg & Fogg PLLC., Attorneys at Law, by calling toll-free at 1-877-425-2374. Serving West Palm Beach, Miami, Tampa, Orlando and Fort Myers/ Naples. There is no fee unless you win.